As motherboards get smaller and CPUs run cooler the demand for smaller cases grows. The idea of the small form factor case is nothing new but these days awe find the number of these is growing as well. The idea is simple; stuff a motherboard (complete with CPU, GPU etc), optical drive and some type of storage into a small area while keeping things cool, pretty easy right? 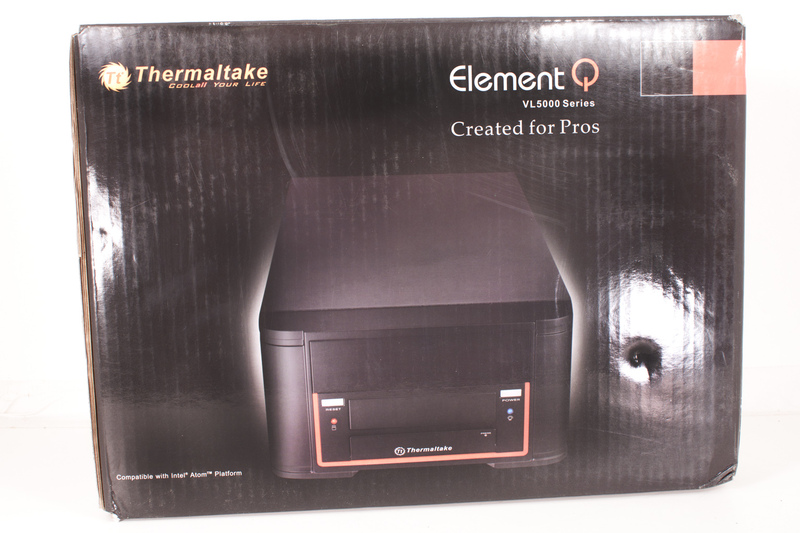 We take a look at one entry from ThermalTake; The Element Q. 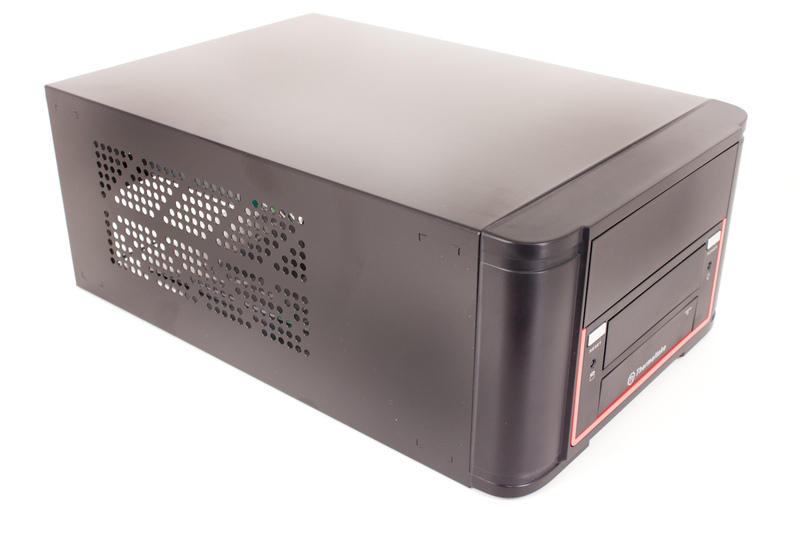 This is a small form factor case that has a few nice things to offer (like a 200 Watt Power Supply). So let’s take a look that the Element Q and see how it handles a system built around the Intel Core i5 661 CPU. The box, like the case is small. I was a little surprised at the size of it when it showed up on the doorstep. The front has an image of the case with a slight glow around it to make it stand out from the black background. At the lower left hand corner there is a small tag line saying “Compatible with Intel Atom Platform”. We have to wonder if this is a cooling issue or a power issue; we will find out either way. 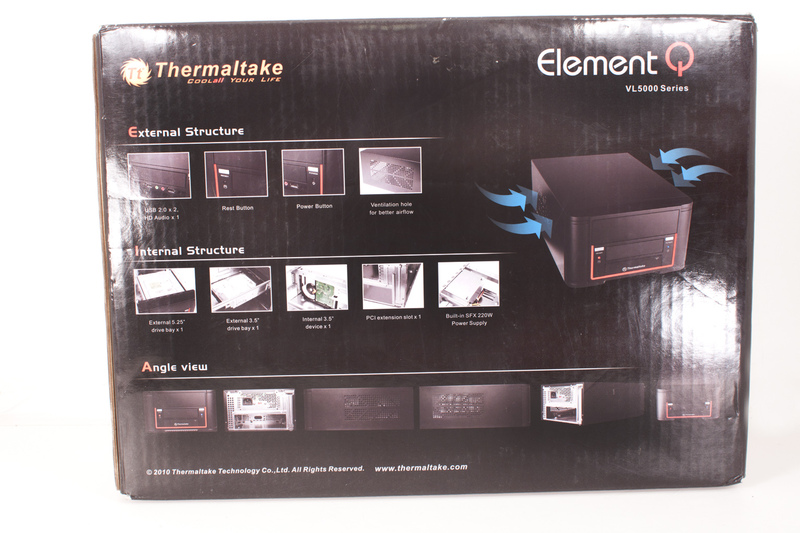 The back of the box has some nice shots of the outside and inside of the Element Q along with an air flow diagram (these are becoming standard on cases). There really is not much more to talk about on the outside of the box. Inside the box we found just the Element Q; at least that is all we found until we pulled the case cover off of the Element. Inside were all of the goodies that we were looking for in the box. You get the usual compliment of screws and mounts, a few brackets and a simple manual. 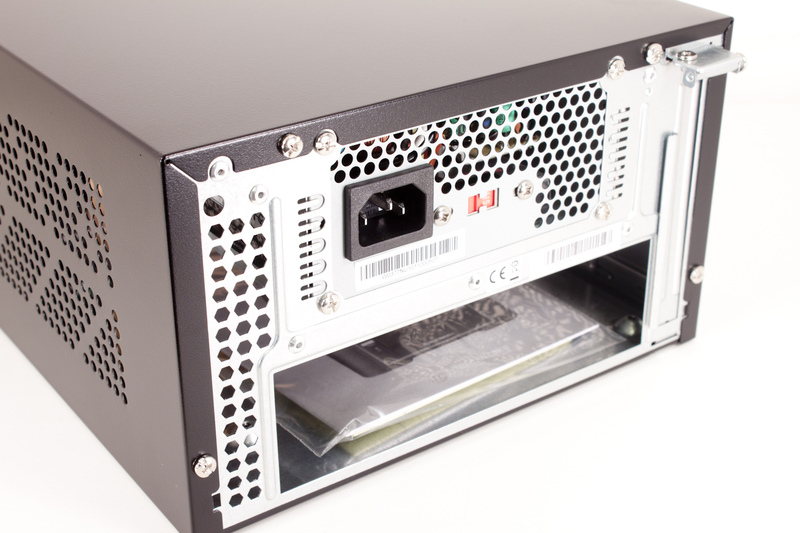 Also you can see that 200 Watt PSU we talked about. Not a bad little add in. The Element Q is a pretty cool looking little box. The front is a plastic façade while the back and frame of the case is made of metal (not aluminum though). Looking at the front you have space for a 5-/14 inch optical drive (a nice full sized one). You could also drop in a 3-1/2 inch card reader if that is your thing. However you might want to leave that for an extra storage drive though. Beneath this is a spot for front USB ports, audio, MIC etc. 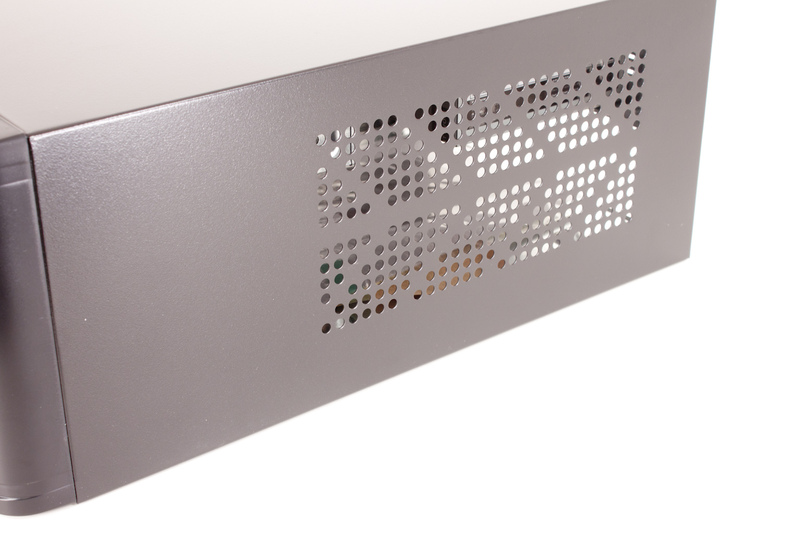 The sides of the case have almost identical vents to allow for proper airflow. Moving around to the back we find the pre-installed power supply and the one peripheral slot. 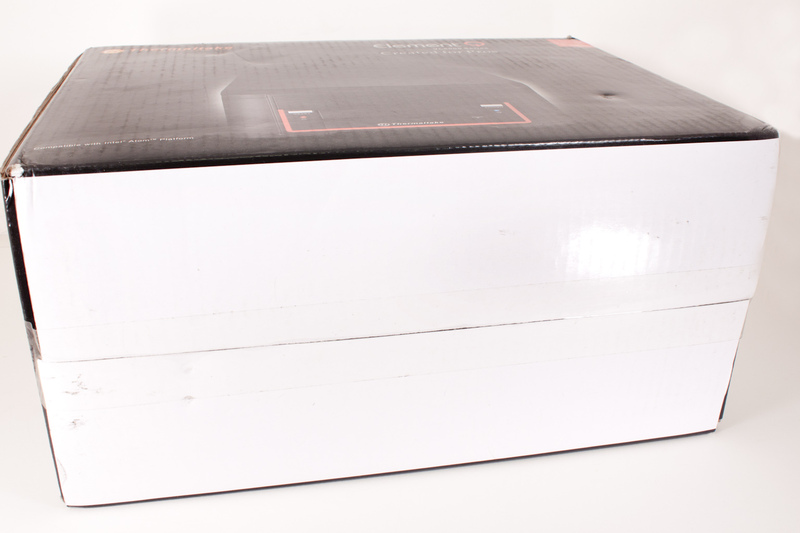 The bottom of the case is unusually flat for a PC case. There are four rubber feet that will fix this but I was a little surprised to see this though. Pulling the cover off of the case we get to see the frame and just how small everything is inside. As we mentioned before you have room for a full sized optical drive and two full sized 3-1/2 inch drives (one fits on its side along the right side of the case). 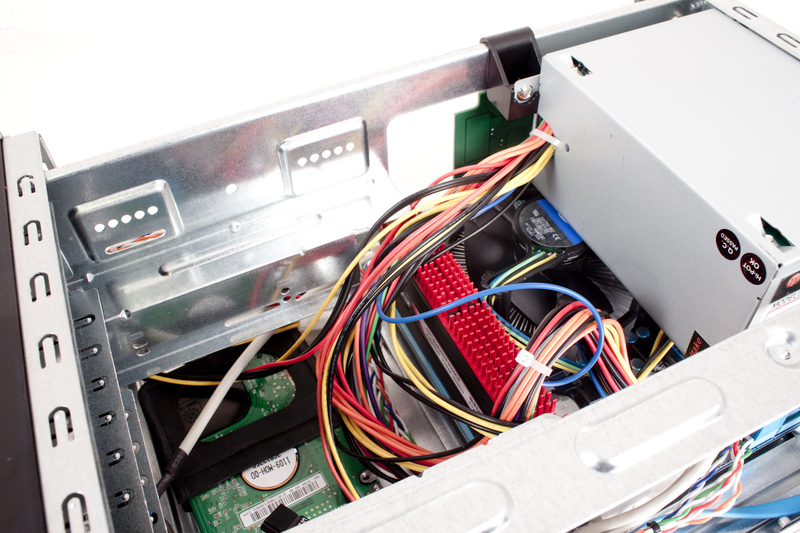 The PSU does come out; in fact it has to come out for you to install any motherboard into this case. 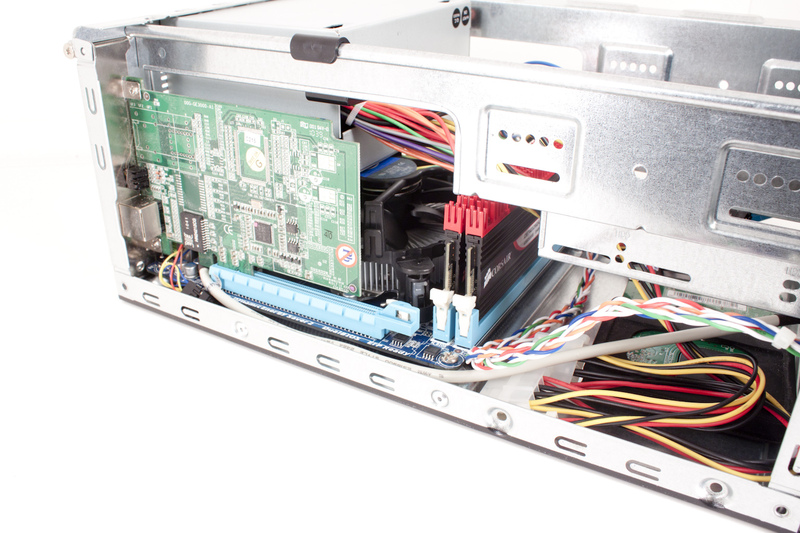 The power supply has a 20+4 pin ATX power connector with the standard 4-pin aux connector as well. 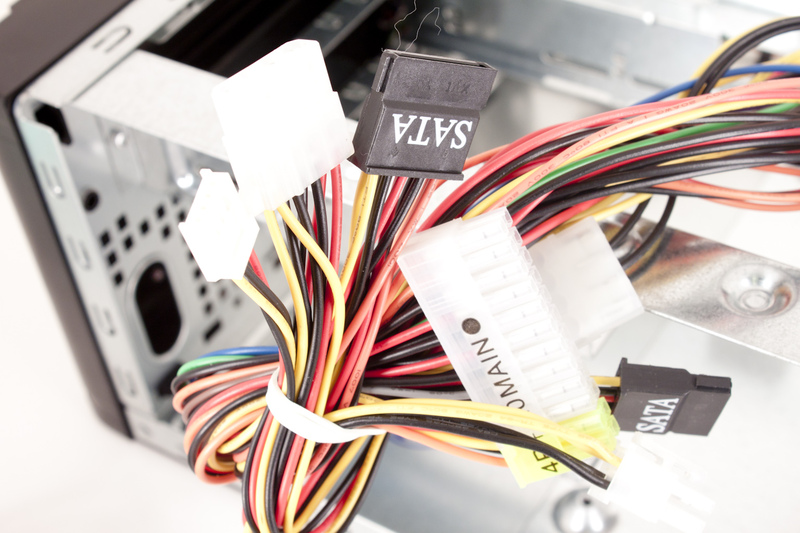 For extras you get two SATA, two Molex and one 4-pin floppy connector. You are not going to power much but you have enough for a fairly decent HTPC or basic workstation. Oddly enough there are no fans internal to this system which means that the only airflow you are getting is from the weak fan in the PSU and whatever one you have on the CPU (if it is an atom many of them are passive). In fact as you can see we wedged a Gigabyte H55N-USB3 with 4GB of Corsair RAM and an Intel Core i5 661 CPU in side this case. For storage we used a 250GB Western Digital 5200 RPM laptop drive. Now let’s see how this setup performs. Like most things that I review I tend to look at more than one aspect of performance. For me a case has to offer several things before it makes the cut. One of the first things it has to do is be easy to work with. It can be the best looking case on the planet, but if you cannot get your parts installed properly well then it is useless. The next thing it has to do is keep your parts cool this is the air flow test. Lastly (in my book anyway) it has to look good. Surprisingly enough the Element Q was easy to work with. There were more than enough screws and mounts and once the PSU was removed (again very easy) we have excellent access to the inside of the case. We found that our RAM was a little tall and required us to angle our H55N into the case but everything fit. Once again our RAM choice got in the way of things we wanted to do. 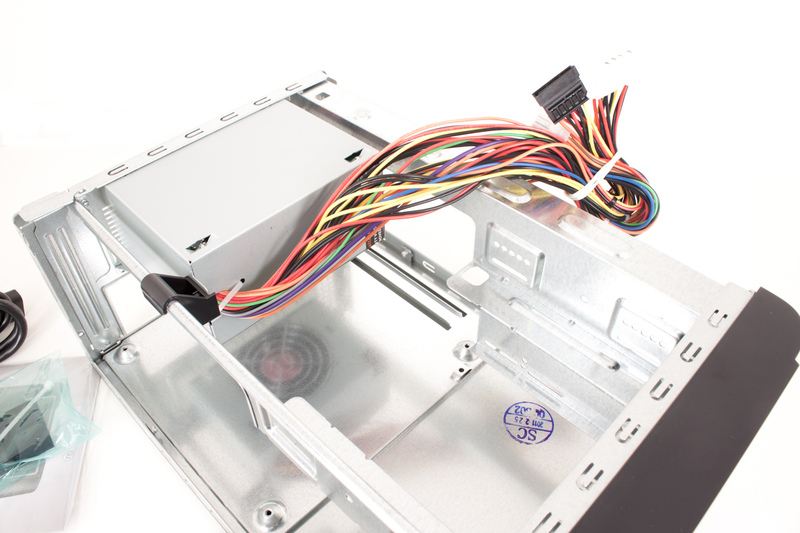 The fins on the heatsink were too tall and prevented us from installing a standard HDD in the front mount and we did not want to block the vents on the side with a drive. This is why we opted to put our smaller 2.5-inch drive in the front on the bottom of the case. With a shorter style of memory you will not have any issues. I have to be honest here; I was not impressed with the basic air flow. 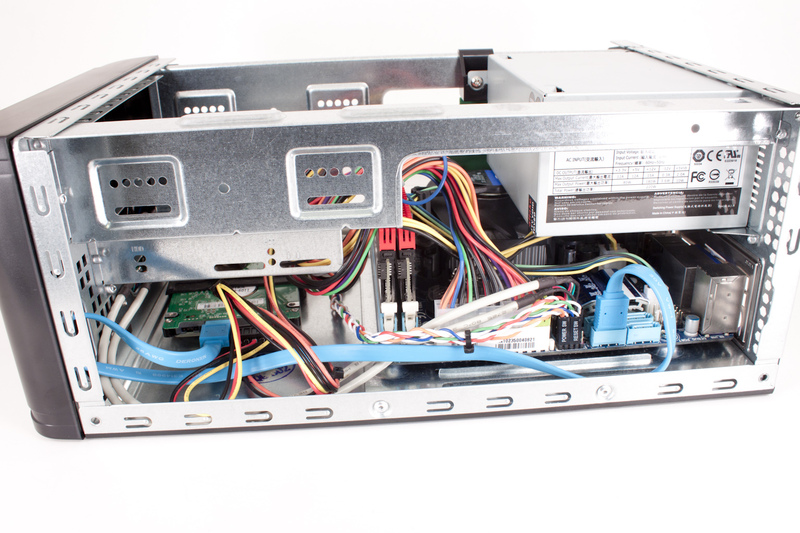 Remember our configuration has a Core i5 661 in place with the stock fan and of course the fan from the PSU. Between these two I would have thought the air movement would have been better. Now this I am not saying that this system was overheating but things did get quite warm. Unless you can add in some extra cooling (maybe putting an external fan on each side to create a push/pull) I would be careful about where you put this. On a scale of one to ten I would put the Element at about a Six. It is nice looking but it is missing something. I cannot really define what it is, but there is something that is missing. Perhaps it is the lack of lights or the plastic front (which takes away from the clean look of the rest of the case). Letting a few others take a look at the consensus was the same. The Element is a nice looking case, but there is something that is missing. Value is another very subjective topic. What is expensive to some might be a deal to others. You can look at this topic in multiple ways. One is raw price and the other is what you get for the money. Each is accurate and both are correct ways to look at price/value. We tend to look at features, performance and real-property when we discuss value. However, we also take into account the raw cash cost of the item. 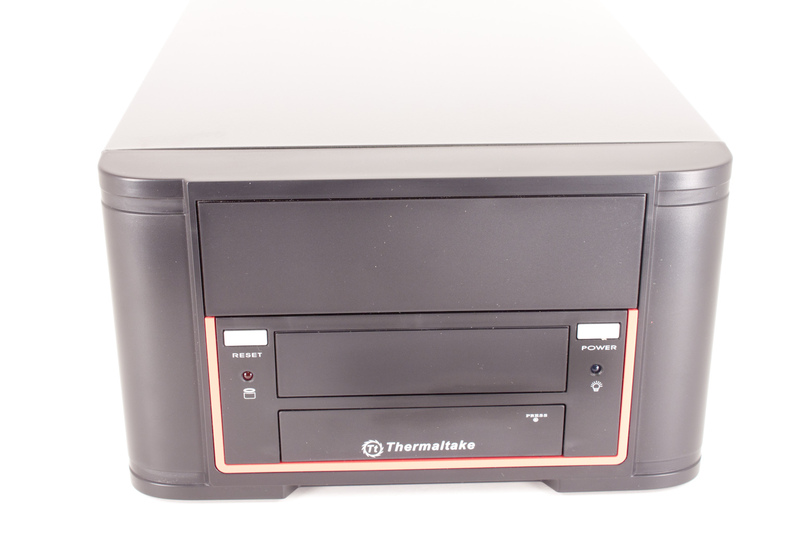 The Thermal Take Element Q sells for around $65 on most E-tailer sites. This is a very good deal considering the included power supply and the general construction. It would be an even better deal if it had included some adapter rails for a 2.5 inch drive (like an SSD) or a side mounted cage for one at the bottom. Still I really have to admit that it is a good deal for what you are getting. What can I say about the Element Q? It is a small and decently built case. It is intended for a low power CPU like the Atom or AMD’s new Llano. We chose to push it to its limits and dropped in a Core i5. We ran it for two weeks with this CPU inside without powering down. 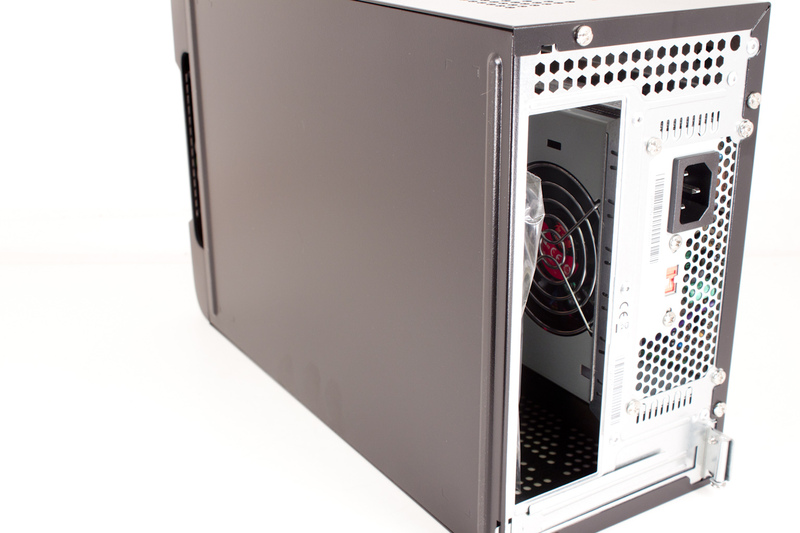 The case got very warm but the system never overheated or powered down due to heat. In fact the system is still running with an extra NIC in it as a standalone domain controller in my enterprise testing environment (for the networking and SAN/NAS reviews to come). If you are looking to build a small quite system as an HTPC or a simple desktop then the $65 Element Q is a case you will want to take a look at.